Verkefnið COLLABORATION_ (SAMSTARF_) www.collaboration-project.de var sett saman árið 2008 af listamönnum frá München í Þýskalandi undir stjórn Thomasar Thiede. Það byggir á því að kynna listamenn frá München á alþjóðlegum vettvangi og koma á samstarfi við aðra listamenn víðsvegar um heim. Sýningarnar COLLABORATION_5 / SAMSTARF_5 verða settar upp í GalleríBOXi / Sal Myndlistarfélagsins og í Verksmiðjunni á Hjalteyri. Á þessum sýningum gefur að líta verk sem eru sérstaklega eru gerð fyrir þessa ólíku sýningarstaði með aðstoð íslenskra listamanna. Samstarf og samvinna eru mikilvægir þættir í vinnu listamannanna. Sýningarnar verða báðar opnaðar laugardaginn 4. ágúst 2012, kl. 14 í GalleríBOXi / Sal Myndlistarfélagsins í Listagilinu á Akureyri og kl. 17 í Verksmiðjunni á Hjalteyri. 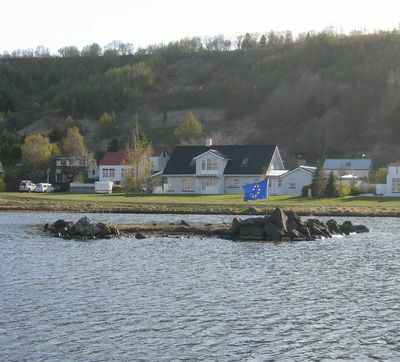 Koma listamannanna og sýningarnar eru styrktar af Sendiráði Þýskalands í Reykjavík, Menningarráði Eyþings, Stiftung Federkiel, Landeshauptstadt München Kulturreferat, Hörgárbyggð, Ásprent og Procar. Nánari upplýsingar veitir Hlynur Hallsson í hlynur(hjá)gmx.net og síma 659 4744. Eröffnung am 4. August um 14 Uhr / Geöffnet Samstags und Sonntags 14-17 Uhr. Eröffnung am 4. August um 17 Uhr / Geöffnet jeden Tag 14-17 Uhr bis zum 12.08. und danach bis zum 26.08 Samstags und Sonntags 14-17 Uhr. Das freie Projekt COLLABORATION_ www.collaboration-project.de wurde von Münchner Künstlern unter Leitung von Thomas Thiede 2008 initiiert und präsentiert künstlerische Positionen aus München national sowie international und lädt im Austausch nationale sowie internationale Positionen nach München ein. Die Ausstellungsserie COLLABORATION_ 5 wird in der Galleri BOX in Akureyri und in Verksmidjan in Hjalteyri Arbeiten zeigen, die speziell für diese Orte entwickelt und mit Unterstützung der isländischen Kollegen ihre Umsetzung finden werden. Kuratiert von Hlynur Hallsson, Beate Engl, Thomas Thiede und Alexander Steig. Kind support: Botschaft der Bundesrepublik Deutschland Reykjavik, Menningarráð Eyþings, Stiftung Federkiel, Landeshauptstadt München Kulturreferat und Hörgársveit. Additional support: Ásprent und Procar. The project COLLABORATION www.collaboration-project.de was initiated by seven German artists grouped around Thomas Thiede. The main feature of the project is a collaboration of artists who in various conditions of new environments - either artistic or geographical - create site specific works referring to a specific character of particular places. Collaboration among artists or with other art collectives is a key element in the project. The exhibition COLLABORATION_5 at Galleri BOX in Akureyri and Veksmidjan in Hjalteyri will show pieces of work specially done for this very places. Curators: Hlynur Hallsson, Beate Engl, Thomas Thiede and Alexander Steig. Kind support by: Botschaft der Bundesrepublik Deutschland Reykjavik, Menningarráð Eyþings, Stiftung Federkiel, Landeshauptstadt München Kulturreferat und Hörgársveit. strip - images in line - a project curated by German artist R o l f B i e r - is about s e q u e n c e s as an yet undiscovered artistic format. The screening at Villa Arson will show a selection of more than 30 sequences by international artists, taken from "striparchive" , an ongoing collection of artists´sequences. It includes slide-projection as well as beamer-projection. "strip" itself doesn´t focuses on movies, even if the concept borders exactly the point where single images are not quite single images anymore and than still not film yet. single images are just simply shown i n t i m e.
Moreso strip deals with the question how images are created at all and how continuous perception and our memory are interacting. strip - venues Kunstverein Hannover, Künstlerbund Berlin, Kunsthaus Baselland (CH), Kunstmuseum Stuttgart, Overgaden/Kopenhagen etc. Shade had accompanied and pursued mankind since the beginning – as an intimate and fatal companion. The cultural history of shade and the history of the civilization of mankind are inseparable. The mythical interpretation of the phases of the moon has fallen prey to the knowledge of the constellation of the heavenly bodies. Nevertheless, the interplay between the lightening and darkening of the earth’s satellite remains a eternal, attractive performance, like the sunset which celebrates the approaching darkness. Light and shade are great antagonists. Numerous are the pictures and concepts relating to shadow, numerous too are the artistically, academically and religiously motivated approaches and appropriations. People always try to express, physically and metaphorically, to describe the world -- or to transfigure it. In doing so, shade suffers from a lesser appreciation than the light which brings it into relief. The most significant interpretation of this subordinate position must have reached its first apogee in Plato&#39;s cave simile, and further manifested itself in C. G. Jung&#39;s analytic psychology -- in which shade is one of the archetypes. The ambivalence of shade passes from the fear-precipitating analysis of a X-ray up to the protection sought against the torrid sun. The (visual) person needs, looks and produces shade. The arts, like painting, graphics, stage, film, photo, to name a few. are at first glance, technically, shadow disciplines. The visual adaptation of these concepts is a celebration of the shade. The SHADOW project presents 13 artistic attempts by people who seek involvement in the different levels of interpretation of the subject; dedicating themselves to the qualities, conditions and manifestations of this common phenomenon. Laugardaginn 24. apríl klukkan 11 opna ég sýningu í Kunst im Wohnraum í Essen. Á sama tíma verða fjórar aðrar sýningar opnaðar í borginni á heimilum fólks. Það eru vinir okkar Volker og Grazyna Troche sem eru með þetta sýningarrými sem er byggt á hugmyndinni um Kunstraum Wohnraum sem er svo aftur byggt á hugmyndinni um Gallerí Gang. Hér er tilkynning um sýningarnar og myndin er af öðru verkanna minna, póstkorti sem fólk getur tekið með sér og sent til vina og ættingja.